The Law Registrar’s Office can provide Law School/Law Career Transcripts for free from for the Class of 1985 to the present. 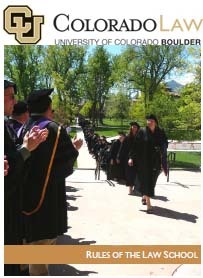 These transcripts are considered unofficial by University standards, but they will include all coursework taken specifically towards a degree at the University of Colorado Law School as well as Law School ranks, Public Service Pledge awards, certificates, and Order of the Coif and Dean’s List notations, as applicable. Number of transcripts needed and whether you need transcripts in paper copy or as a PDF (please include the address if you need a paper version sent somewhere). Unofficial CU transcripts: Current students may access their in-progress unofficial CU transcript using the MyCUInfo student portal (click on the Student tab and choose the "View/Request Transcripts" button). Official CU Transcripts: Only current students may order an official CU transcript using their myCUinfo portal, but current students and alumni alike may order through CU Boulder’s Office of the Registrar. Please click here for information on transcript ordering, online order status, general information, and transcripts frequently asked questions. Note that CU transcripts will not include certificates, Law School ranks or Public Service Pledge notations; however, they will include Order of the Coif, and Dean’s List notations. Classes before 1985, you must request transcripts through CU's main Office of the Registrar (no PDF transcripts are available from the Law Registrar's Office for pre-1985 graduates). Please note that any financial obligations with a CU campus must be resolved before a transcript can be released. Students with access to MyCUInfo should check the Alerts section for any holds on their account.